Casa Portuguesa is part of Vivenda A nossa coroa. Vivenda A nossa coroa is a small holiday complex with 3 complete and nicely decorated holiday bungalows at the foot of the Serra da Estrela, the largest natural area of ​​central Portugal. Casa Portuguesa is a corner house and furnished with Portuguese details, 2 bedrooms (max 5 pers. ), A well-equipped kitchen, cozy living room with wood stove and satellite TV, free WiFi, nice bathroom with bath, separate shower and a large private terrace with fantastic views to the mountains and picturesque mountain villages. All rooms have Wi-Fi, central heating and ground floor, no villages and suitable for all ages. In the house there is a thick folder with documentation about the area. For shared use there is a large swimming pool 10x4 mtr. and an outdoor bar. For the youngest we can put a children's pool. There is a large recreation room with a library of modern (Dutch) books, ping-pong table, shuffle box, various games, washing machine and free Wi-Fi. Vivenda A nossa coroa is located between the villages Coja 3 km and Arganil 7 km. In Arganil is the imposing town hall and this village has the well-known supermarkets like the intermarche and the Lidl. Coja is a cozy and lively village all year long: bakers, grocers, pharmacy, bars, restarants e. d.
In the center of Coja there is a large terrace where you can enjoy a nice meal. 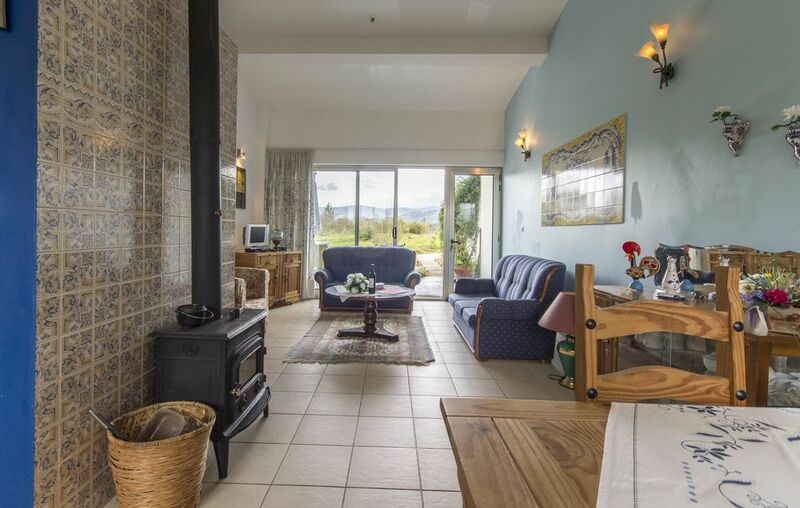 Come and relax in beautiful surroundings, a beautiful holiday home with Dutch owners. No mass tourism and enjoy the pure Portugal with the magnificence of the mountains and the tranquility of the rippling streams. Vivenda A nossa coroa is located in the province of Beiras Litoral, about 60 kilometers east of Coimbra. Authentic Portugal where you regularly meet the shepherd with his sheep or goats. A quiet area not yet flooded by tourists and surrounded by mountains. Fantastic hiking area with many rivers where you can swim in a great way. Vivenda A nossa coroa is at the foot of the Serra da Estrela, a giant natural area with a peak of 2000 meters high. The surroundings of mountains and rivers. In the surrounding area you can swim in the river. The area is great for hikers, cyclists and nature lovers. Lots of culture, picturesque mountain villages, canoeing on the Mondego River, canyoning, horse riding, jeepsafari e. d.
Student City Coimbra is the nearest city in about 60 km. In addition to a historic center with the top of the beautiful old university, chapel and library of 1728, there are also several modern shopping centers. In Coimbra, the fado is regularly sung in small cafes and in the church. The Atlantic Ocean's major beaches are reached by car in 75 minutes. Piodao, slate villages. University city of Coimbra. Nature reserve. Local markets.